By early 2007, homeowners in the United States were already in trouble. Many were having serious problems making their mortgage payments. But former Federal Reserve Chair Ben Bernanke downplayed the risks. Instead, the ensuing fallout would be so severe that the word “subprime” would forever be associated with the credit crisis. Today, contagion risks are being dismissed in a similar fashion. Many say that the problems in the high-yield corporate bond market are confined to the energy sector. For those who harbor this misguided view, I present the following chart of high-yield credit spreads by sector. Corporate bond credit spreads basically reflect the perceived risk of default. The wider the spread, the higher the risk, and, thus, the more yield demanded by bond investors. In July 2014, every single sector – including energy – had an average credit spread below 400 basis points (market-value weighted average spread). 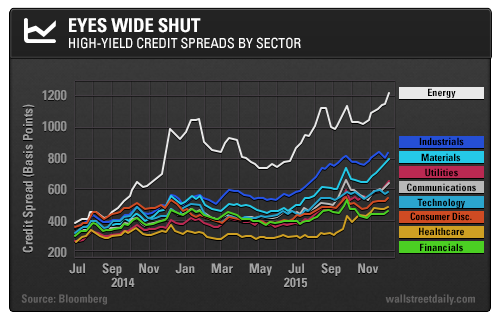 Less than two years later, not a single sector’s average credit spread is below 400 basis points (bps). Of course, energy companies are leading the way, as spreads have blown out past 1200 bps. Credit distress in the energy sector is only part of the story, though. The second-widest spreads belong to the industrial sector – not the materials sector. Yes, the credit markets realize we’re in an industrial recession. However, even the “safe” sectors are experiencing strains. At over 650 bps, utilities spreads are the fourth-widest of all the sectors. High-yield healthcare spreads have widened from below 300 bps just a few months ago to nearly 500 bps. I talked about how Valeant Pharmaceuticals International Inc. (VRX) was the top high-yield bond issuer this year. Last week, Third Avenue Management made waves when it announced that it was suspending withdrawals in its high-yield/distressed debt mutual fund. Then on Friday, hedge-fund firm Stone Lion Capital Partners also suspended redemption in a credit fund. Naturally, funds throwing up gates won’t engender confidence among credit investors. Rather, it will lead to more risk aversion, which will impact junk bonds in every sector. As a whole, high-yield bonds experienced a monumental mispricing in 2013 and 2014. Companies issued record amounts of bonds at miniscule yields to quench investor demand. Call it a credit bubble if you like. Due to the collapse in crude oil prices, the energy sector was simply the weakest link and the first to run into major problems. Ultimately, credit distress isn’t contained. The credit cycle has turned, and a default wave in corporate bonds approaches.